• Great competitions Win a designer gown, a luxury honeymoon and more! • Budget-saving tips Find out how these brides wed for £3,500! • More real-life weddings than ever 78 pages of inspiration! • The best planning tips Have a stress-free wedding day! • Fun quizzes Find out if you’re a bridezilla! This has to be my most favourite issue of the year… The Real-Life Wedding Special! Combining a bumper section in the magazine with the free real-life magazine this issue, readers get a whopping 78 pages of real stories, packed with inspiration! 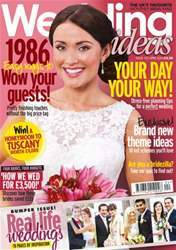 On top of this we filled this issue with features from the experts – the real brides themselves! Check out their favourite venues (page 198), how they budgeted their day from only £3,500 (page 180) and what they've chosen for their first dance tunes, too (page 190). 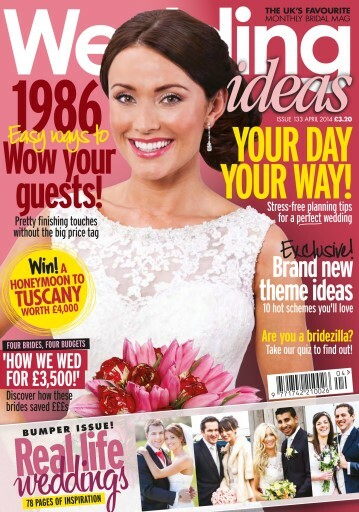 Also inside this fab issue you'll find gorgeous gowns to suit your theme (page 53) plus bridesmaid dresses inspired by red-carpet stars (page 79). Struggling to find your perfect finishing touches? Turn to page 211 and read on for stunning jewellery, stationery and reception details, all at affordable prices. And if, like me, you just can't find the right heel height for you, check out our feature to find the perfect footwear, from little kitten heels to super-comfy stilettos (page 96). With only four months to go until my own wedding, I can really appreciate how manic it can all be, so please feel free to drop me a line or tweet any time if you need any planning advice. We're here to help!